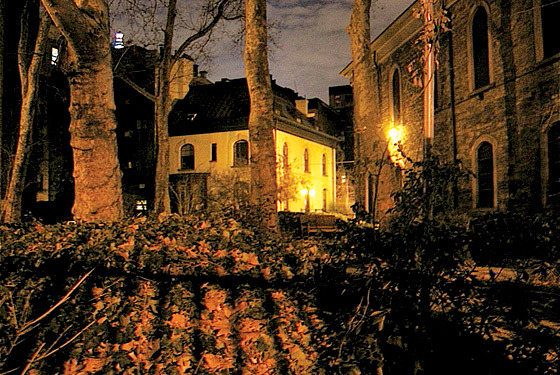 All night long they kept coming, pouring in through the great old iron gates of St. Mark’s Church on Second Avenue. Inside, under the vaulted ceiling, people were sweating and swaying to excellently named bands—the Young Lords, the Virgins—the music so loud you could feel it, like a fist, thumping in the middle of your chest. Outside in the garden they huddled around the grill or lined up at the bar for four-dollar cans of Bud Light, everyone drinking a bit more than usual, perhaps, because it was July 3, 2007, and all anyone had to do tomorrow was sleep until the headache subsided and get out of bed in time for the fireworks. St. Mark’s was where Andy Warhol screened his early films, where W. H. Auden and Allen Ginsberg held readings, where Sam Shepard staged his first two plays, and here was an evening dedicated to celebrating and preserving this tradition: everyone out to get a little lost and loose and in the process raise money to restore the church’s chipping façade. It had been a while in the works, this unorthodox benefit, and everything would have been going as planned were it not for the absence of two people. Duncan and Blake had been found in the rectory, seated by the window, looking down at the party—their party—below. Without apology they explained that they could not come down, no, they were experiencing a “collective vision” that the grill was going to explode, somehow harming Duncan. It would have been a more troubling exchange were it not, by this point, almost expected. During their moments of clarity there were few people as thrilling to be around as these two—the banter was invigorating, the exchange of ideas fervent—but an incident like this was a reminder that moments of clarity were increasingly rare. For many friends this image of the couple—abrasive, frightened, isolated from what they loved and fostered—would prove to be their final memory. Seven days later, on the evening of July 10, Duncan swallowed a number of Tylenol PM tablets with bourbon. It was Blake who first discovered her body on the floor of their bedroom, and it was Blake who, a week later, ended his own life by taking the A train to Rockaway Beach and walking into the Atlantic Ocean. In time everyone had a theory, a hypothesis, an eagerness to impose his own story line onto what had happened. To some the “double suicide,” as the newspapers called it, reinforced the quixotic fantasy that artists are somehow too pure for the harshness of the world. To others it was a Shakespearean tale of a love so tragic and potent that one person could not live, literally, without the other. According to the blog Dream’s End, the deaths were not suicides but murders connected to an “alternate reality game.” As more details emerged—about their troubles in Hollywood, their claims of harassment by Scientologists, and how many people they had thoroughly alienated in recent years—the narrative grew harsher. Now their deaths became a story of wrathful envy, of toxic ambition, of fame obsession, of a woman spurned by success, of a terrible conspiracy, of madness. People so quickly grew fixated on trying to define what Duncan and Blake represented in death that it became increasingly difficult to understand and remember who they had been when they were alive. They had first met in 1994, in Washington, D.C. Some say it was at a Fugazi concert—Blake was close with the seminal punk band—others remember the two running into each other at a house party. Whatever the case, back then they were no more than casual acquaintances. Blake, then in his early twenties, had recently moved back home after receiving an M.F.A. from CalArts, and was still figuring out what he wanted to do as an artist. Duncan, on the other hand, was already known in certain circles as something of a force: a punk spirit sheathed in designer clothes, a woman always swimming against the current. Aggressive and unrelenting when she needed to be, which was often, Duncan convinced her bosses at Magnet Interactive, a CD-rom manufacturer, to give her $80,000 to create, along with colleague Monica Gesue, a video game for girls called Chop Suey. The game centered on two sisters, Lily and June Bugg, who drift into a food coma after gorging on Chinese food and take a whimsical journey on clouds that morph into tennis shoes and teapots. Narrated by the then-unknown David Sedaris, Chop Suey was universally praised for transforming the medium: a child’s game that had an edge, that lacked condescension. It was here in the Nolita loft that Blake began to experiment with making fine art on a computer. 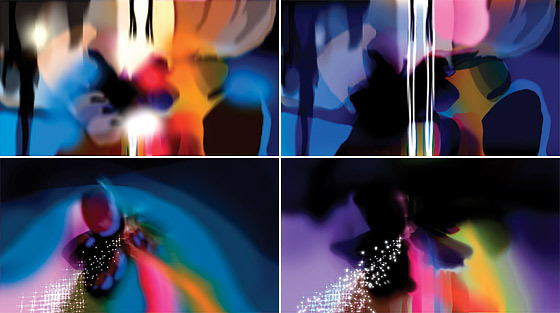 Using an electronic drawing tablet, he started creating abstract, brightly colored digital prints which then evolved into slowly looping films. The work was beautiful, opaque, and evocative, and the medium was somewhat unclassifiable: not painting, not digital art, but something that merged the two into a new form. Duncan, meanwhile, was writing a script, about a teenage girl who moves to New York seeking stardom as a model, that would become an animated short called The History of Glamour. It was a collective endeavor: Blake illustrated; Brendan Canty of Fugazi and Bikini Kill bassist Kathi Wilcox contributed to the soundtrack. (“I’ve been thinking of us in terms of something like the Warhol factory,” Duncan later remarked.) The resulting parody of fashion and fame in Manhattan would prove to be a breakthrough for both of them. That year, 1999, Blake’s first solo shows in Los Angeles and New York received glowing reviews, and within the span of a few months in 2001, Beck called about having Blake design the album cover for Sea Change, and the director Paul Thomas Anderson requested that Blake work on his latest film, Punch-Drunk Love. In the meantime, Duncan had secured a two-picture deal with Fox Searchlight. With all that was happening for the couple, a move to Hollywood became inevitable. In the beginning, the move seemed ideal for Duncan and Blake, another adventure in which each served as the other’s navigator. There was the subtropical sunshine, the new people to meet. There was the cottage in Venice, which they adored. (“Unlike in New York,” Duncan sometimes remarked, “here you can live like a real adult.”) Soon they were throwing parties, creating a social life quite similar to the one they had back East. Duncan, who had never learned to drive, got her license and bought a used butter-yellow Alfa Romeo, which she would take for meandering drives along the Pacific Coast Highway. Blake found studio space in Santa Monica, a large room lit by skylights, where he worked with music blasting and a glass of Maker’s Mark nearby. Though still abstract, his films were becoming more overtly story-driven, infused with themes of paranoia and secrecy. Here he would complete what was to become his best-known work, a series of films based on the California mansion of Sarah Winchester, the widowed heiress to the Winchester- rifle fortune who built a 160-room Victorian home in the hopes of warding off the ghosts of the victims of her family’s legacy. Blake’s work was also becoming more valuable, sought out by museums and collectors who would fly into town to take him and Duncan to dinner. One of these collectors was Bradford Schlei, a producer, who optioned the George Pelecanos novel Nick’s Trip and put it into development with Blake signed on as director. Duncan, though, was having a far more challenging experience of Los Angeles. 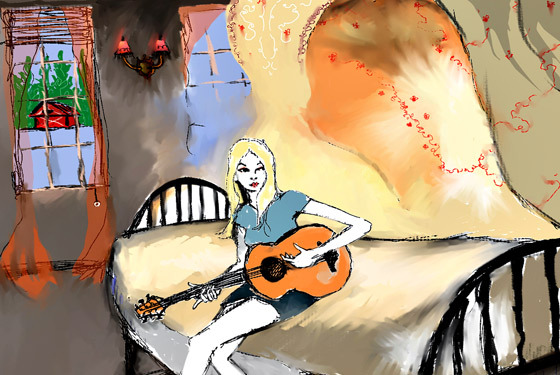 Her movie—Alice Underground, about two girls from a New York prep school who abduct a rock star—had entered a vicious cycle: gaining momentum and then suddenly petering out, over and over, until the option expired. To spend so much time and energy talking about the idea of doing something, to listen endlessly to the hollow enthusiasm that drives the film industry: Here were the forces that have maddened countless writers and artists. Time passed. She wrote new scripts, pitched smaller projects, freelanced as a critic. More time passed. She created her blog, The Wit of the Staircase, taking on a variety of topics (Kate Moss, poetry, reality TV, philosophy) with her sharp-tongued brand of pop erudition. By 2005, Alice Underground was at Paramount, but here the same patterns repeated themselves. This was not an unusual story in Hollywood, where most projects languish for years before colliding with the voodoo necessary to transform a script into a film, but for Duncan it was a first: a case in which sheer force of will and personality were not enough to build the world she was striving to create. Their deaths became a story of wrathful envy, of toxic ambition, of fame obsession, of madness. As had always been the case, Blake did not doubt that her concerns were justified; Duncan’s opinion was the final word on all matters. And so as the joy of success had once been felt in tandem, these frustrations were experienced as being inflicted upon them both. Blake, never an aggressive personality before, became increasingly antagonistic and distrustful of “the system.” They seemed to fuel something in each other, growing convinced that what they were experiencing was not the fickle, indifferent hand of Hollywood, but larger, more sinister forces working toward their ultimate destruction. It was never an easy thread to follow, never a comfortable moment when they laid it out for you. There was the cocktail party the couple threw in December 2005, for instance, a small gathering, only six people, which had begun like any other night at their house: good drink, better conversation, a fire going, the ashtray on the coffee table filling up. But then Blake, triggered by nothing in particular, spent 45 minutes talking about his relationship with Beck, about how the two grew close after working together on the album cover but ultimately had a falling-out because Beck was a practicing Scientologist, and Scientologists, Blake was confident, used networks of spies to watch over anyone they perceived as a threat to the church. (Beck says that he last spoke to the couple in the summer of 2004. “There was never any discussion of religion or anything personal,” he says of their friendship. And the Church of Scientology told the Los Angeles Times: “Never heard of these people. This is completely untrue.”) Later that evening the topic turned to Miranda July, whose independent film Me and You and Everyone We Know had recently been released. Suddenly Duncan and Blake were going into detail about how July, whom they also suspected of being a Scientologist (though she is not affiliated with the church), was “stalking” them, how she was somehow connected to the larger scheme, out to sabotage their careers and possibly their lives. In retrospect it would seem like an affliction of sorts, a miswiring of the mind, a case of the city’s “terrible boredom” playing tricks on them. Throughout 2006, they began to accuse close friends of somehow being involved in the plot; some were asked to sign formal “loyalty oaths,” others were bombarded with vicious e-mails that had little connection with reality. Christine Nichols, who offered Blake his first solo show at her gallery Works on Paper, was mystified when Blake abruptly terminated their friendship. Reza Aslan, a young Islamic scholar who socialized with the couple, was startled to be accused, over e-mail and on Duncan’s blog, of being affiliated with the CIA (Duncan believed that the Church of Scientology was a front for a government intelligence agency). Blake abruptly dropped out of his film project, telling Schlei, the producer and by this point a close friend, that he was unknowingly dating a Scientologist. Schlei denied this; Blake stopped speaking to him. An old friend suggested that Blake see a psychiatrist, that what he was experiencing was connected more to his impressive imagination than to anything else. Blake was dismissive, claiming that therapists were part of a “new world order.” Shortly after that, they lost the Venice cottage. Some say they were evicted, that they had been forced out after Blake tossed urine onto the barbecue of a neighbor they believed to be a Scientologist; others believe they were simply scaling back on expenses. They moved into Blake’s studio—not the airy space in Santa Monica, which he had given up, but a far more modest corner of an office complex at the edge of Venice. And then, in early 2007, their old friends in New York began to receive excited phone calls from the couple. As always, the details were important. They could not live in an ordinary apartment. In December 2006, Duncan had read an article in the Times about the New York apartment of Steven Sater, lyricist for the Broadway musical Spring Awakening: one of a handful of small, eccentric spaces carved out of former maids’ quarters on the top floor of the Dakota. “You feel like you’re in another world,” he said of living there, “a world where your imagination just feels free.” Duncan decided that she and Blake had to live in a similar space in the building upon their return. She hounded real-estate agents but was told there were no openings in the Dakota. There was, however, another apartment she might be interested in: the two-bedroom apartment on the top floor of the St. Mark’s rectory. It was a space unlike any other in the city, connected to a 200-year-old building with a history bound to bohemian New York. Perfect. If the move was an effort to right whatever had gone wrong in Los Angeles, it seemed to be working. On Mondays you could find them at the Beatrice Inn, in the West Village, nursing drinks with old friends. Or maybe you ran into them at the Waverly Inn or Freemans, cozy, exclusive restaurants that appealed to their sensibility. When it got late, the chances were high that you could catch them having a nightcap at Bungalow 8. (The Chelsea lounge is named after an early work of Blake’s owned by the bar’s owner, Amy Sacco, a longtime friend of the couple.) At St. Mark’s, they became close with Frank Morales, one of the church’s pastors and a liberal activist who has been a fixture in downtown circles for decades. Duncan was devoting most of her energy to her blog, while Blake was working at a frenzied pace, consulting at Rockstar and preparing for his upcoming solo shows—one at his New York gallery, Kinz, Tillou, and Feigen, the other at the Corcoran Gallery in Washington, D.C. In January, Blake was a featured guest at a screening of Factory Girl at the headquarters of William Morris—a small, informal event organized by the Whitney to cultivate younger patrons. Blake was always skilled in these environments, understanding of his role, adept at charming potential donors, and in most respects tonight was no different. Except that when he ran into Christine Nichols—his former dealer and close friend of nearly a decade—he acted as if he had never met her before in his life. It was a reminder that something remained off-balance, that perhaps the paranoia hadn’t been left behind in California. Friends in New York had a dim understanding of what had been going on in Los Angeles—they had experienced the casual phone calls from Duncan and Blake that turned into two-hour digressions about spies and Scientologists and government operatives—but at the same time the couple were often in high spirits, still warm and generous with many. They had spent that Thanksgiving at the Napa home of their old friend Blake Robin, and nothing seemed particularly worrisome. They had gone to Miami that December to attend Art Basel, the international art show, where they were outgoing and social. And you could, in a sense, rationalize their occasional erratic behavior. They were artists, after all, and artists are allowed a degree of lunacy. But soon friends in New York started receiving the same accusatory e-mails that the couple had sent to so many in Los Angeles—and the behavior no longer seemed like mere eccentricity. When it came time to plan the July 3 benefit at St. Mark’s, for instance, Duncan banned an old college friend of Blake’s from attending the party—no reason was given. Days later, when another friend ran into her at Liquiteria, an East Village juice stand, she accused him of eavesdropping on her telephone conversations; then Blake showed up and nearly got into a fight. The two started speaking compulsively of a massive lawsuit against the Church of Scientology, of a document they were putting together that would make clear that they were by no means being hijacked by their imaginations. Many friends had hoped this document was a fiction, a hope that faded after the couple’s deaths, when the Los Angeles Times published portions of the 27-page document. Here Beck was formally singled out as starting the couple’s conflict with the church, and Tom Cruise is ultimately blamed for killing Alice Underground at Paramount because the script clashed with “his profound loyalty to Scientology,” an accusation the actor denied. Nearly everyone they had a working relationship with—agents, producers, studio executives—is mentioned as being part of the conspiracy. In light of these events, it is tempting to think of what happened on July 10 as somehow making “sense,” as the moment when Duncan, at least, reached the bottom of the spiral. And yet no one remembers Duncan talking about the Scientology conspiracy that day. She updated her blog with a portrait of a blonde woman putting on a mask and a benign quote from the novelist Reynolds Price: “A need to tell and hear stories is essential to the species Homo sapiens—second in necessity apparently after nourishment and before love and shelter. Millions survive without love or home, almost none in silence …” She and Blake shared a late lunch together, and then Blake left the house for a few hours. When he returned he invited Father Morales up to the apartment for a drink. That was when Blake found Duncan on their bedroom floor. A brief suicide note indicated that she loved him and was at peace with her decision. Many of Blake’s friends from D.C. and L.A. came the next day to offer comfort and to make sure he did not do anything rash. To many he seemed lucid, rational. He talked to his gallerist, Lance Kinz, about the details of his opening. He talked to the Corcoran about the upcoming show. He knew that people were worried that he would contemplate suicide and tried to calm their nerves. “I am not going down that rabbit hole,” Blake would say. “No way am I going to follow Theresa.” Another night he told a friend, “I didn’t realize how much you guys love me. Now I know. I get it.” He started planning a memorial service, telling friends to make sure there were plenty of accomplished women in attendance. He also gave friends a list of names of people to contact in Los Angeles. Things had become complicated over the past few years, he explained, and he hoped they could help him reach out, make amends. But there were other moments, just as frequent, when he spoke of voices and visions, when it was clear a part of him saw her death as connected to the forces that had been consuming them over the years. He spoke of the Scientologists, of their plot. Should he have been hospitalized? It was an option discussed by friends, but Blake was an adult, a grown man, and just as he seemed to be leaning toward the darkness, he would become rational once more. On July 18, he was going to drive with a friend to Michigan to attend Duncan’s funeral (“If we can just get him through this …”), and the day before he was out running errands to prepare for the trip. Blake seemed to be doing well that day, focused on the logistics, and when he told his friend that he was going to drop by the offices of Rockstar Games in order to print out some maps for the drive, his friend was not concerned about this being the first time Blake would be unattended since Duncan’s death. From the office, instead of going back to his apartment, he walked toward the subway and took the A train to the last stop, Rockaway Beach. He was last seen taking off his clothes and walking into the water. According to police, the suicide note found with his wallet referred to Duncan. Shortly after the deaths, workers began repairing the façade of St. Mark’s Church. The chipping portico was sanded, repainted. The July 3 benefit, for many the last time they saw the couple, had raised $12,000 for the church, and it seemed a fitting gesture to put it to use quickly. Today there is a black-and-white photo of Duncan and Blake attached to the iron gate, the two of them staring coolly into the camera lens, his left arm draped around her shoulder. It is a temporary memorial, though there has been talk of creating something more permanent, a plaque, perhaps, to let passersby know that Theresa Duncan and Jeremy Blake, two artists very much in love, had once lived and worked here.